In Fishguard, Wales, a small group of dedicated volunteers is cutting carbon emissions, reducing food waste, creating renewable energy, and building community. Here’s how. With over 80 organic farms in a small area, farmers and environmentalists were alarmed in 2001 when they heard of plans to plant test plots of genetically modified corn in West Pembrokeshire, Wales. A strong community lobby prevented this from happening, but it didn’t stop there. The protest had galvanized the local community and a small group in Fishguard started discussing the possibility of joining the Transition Network. In 2008, Rob Hopkins addressed a large public meeting in Fishguard, and Transition Bro Gwaun was born. Their initial projects were small and designed to build public awareness – a reusable shopping bag, community garden allotments, awareness campaigns (recycling, plastics in the sea), cooking demonstrations, and gardening classes. They were preparing the ground for far more ambitious projects. Fishguard is a windy coastal community, and in 2011 Transition Bro Gwaun’s renewables group started looking for sites for a local community wind turbine. Four years later, a 225KW turbine was in place and beginning to generate energy. Government funding was essential in completing the initial development studies, but from there on in it was fully funded by the community. Ownership is shared 50/50 by Transition Bro Gwaun and the farmer who provided the land. Local residents provided the money to purchase the turbine through 5-8-year unsecured loans. “We expected to have to borrow from the bank,” explains Tom Latter, director and founding member. “But in fact, we were oversubscribed.” Three community groups and 29 individuals provided loans ranging from £1,000 (approximately $2,000) to two of £50,000. The turbine was installed and began operating in August 2015. “We’ve had an amazing winter for wind,” Tom says. “We had predicted 45,000KWh per month, but we’ve averaged 70,000.” The group hopes to eventually market the energy to local people. The energy produced will also offset the energy consumed by the Transition Café. They hope to eventually generate £50,000 a year that will be used to support Transition Bro Gwaun’s other projects. 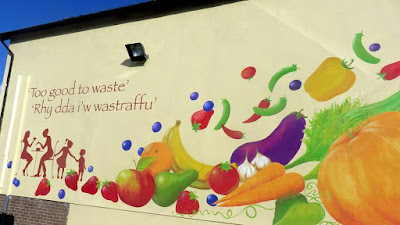 Transition Bro Gwaun was eager to tackle a surplus food project, and when The Co-operative offered them a two-year lease on a building adjacent to the grocery store’s car park, they decided, following community consultation, to open a café. Starting in 2012, volunteers renovated the building and local businesses donated flooring, cupboards, and other essential furnishings. By June 2013 the Café was ready to go. They’re open from 10:30 am to 4 pm, four days a week, as well as for occasional evening and weekend events. A group of volunteers collects surplus food 4-5 times a week from local stores and wholesalers. Large grocery stores were initially reluctant to pass on surplus food due to potential liability issues but have now come on board and WRAP UK provides guidelines and releases to help retailers develop a policy on redistribution. The Café receives 850 kilos of surplus food a month. What they receive varies from week to week, with fresh fruit and vegetables in plentiful supply. They used to have to buy milk but now receive enough to make their own cheese. A key task for Café volunteers is to track the ‘use by’ dates and location of everything they receive. “Everything has to be dated,” Chris explains. “As products are received, they’re entered on the digital database. We try to keep a record of where everything is stored and continually move the older items to the front of the shelves.” The food is also weighed so that they can track carbon offsets. Lunch options range from Mushroom Stroganoff or Crab Cakes to Quiche or Cajun-style Turkey Wings. Desserts are often delicious fruit crumbles with custard or ice cream, and there’s local apple juice as well as tea and coffee to drink. The Café is still operating at a slight loss, with lots of lunch customers in summer, fewer in winter. Prices are extremely reasonable and they have some regular customers who appreciate the healthy, home-cooked food. “We’re less popular with young people who are looking for burgers and fries,” Sue says. One of the challenges is communicating to people that the Café is for everyone, not just poor people. “We want to break the correlation between food waste and poverty. Food waste is everyone’s responsibility,” explains Chris. 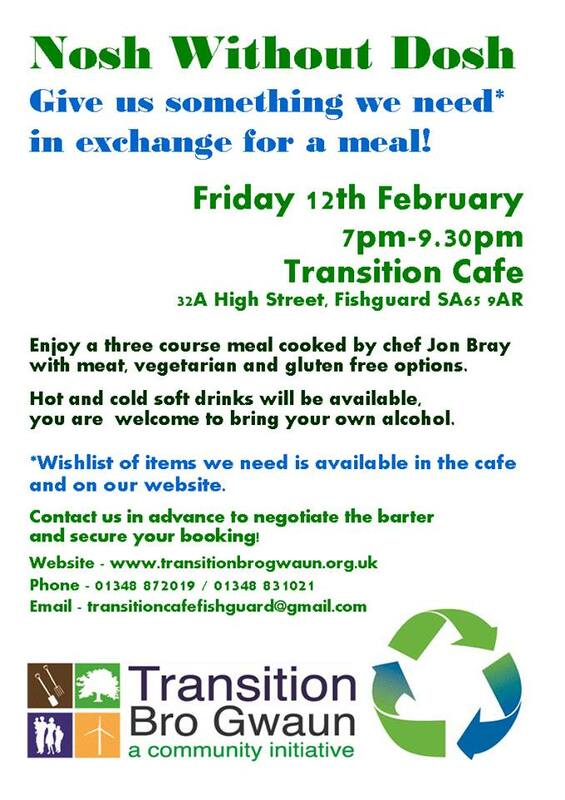 The Transition team would like to start offering cooking classes to help people avoid food waste. “60% of food waste is in the home. Young people, especially ones who are leaving home, may be interested, especially if they realize it will help them save money,” Chris explains. The Café is very labour intensive, requiring approximately 25 volunteers to look after acquisitions, storage, cooking, and front-of-house. At first everyone was a volunteer, but this proved challenging. They were able to obtain funding for a part-time project development officer and hired one cook to ensure consistency. A school group comes in every other Monday to help with food preparation and anything else that needs doing. A youth employment program placed some young people with the Café. Two went on to get jobs in catering while another is now working at the Café. “Debbie John had no cooking experience at first but is turning into a good little cook,” Sue explains. Transition Bro Gwaun has an active Facebook page and over 300 people on their email list. If they need help or donations, someone is usually ready to contribute. “We see ourselves first and foremost as a community resource,” says Chris Samra. “The building was given to us and the community came together and renovated it.” Community meetings are held here in exchange for a donation (e.g. volunteer hours or a gift) and the Café organizes a variety of activities to make use of the space during slower periods of the day. There are craft activities for kids and adults, a pre-school play-and-learn group, a sew, knit, and natter group, and Welsh conversation.. Transition Bro Gwaun’s next goal is to assist local entrepreneurs and facilitate community development. Their own experience has shown you don’t need a lot of money to make things work if you have community support. REconomy is a community-based Dragon’s Den offering local residents the opportunity to listen to the pitches of local entrepreneurs, to choose their favorites, and to support – with supplies or services – the projects that they believe would be an asset to their community. 16 of the 18 projects pitched in Totnes have successfully launched. 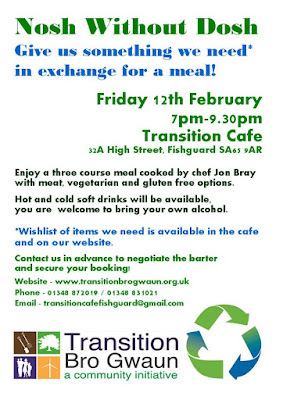 Transition Bro Gwaun members believe that this type of project will work well in Fishguard as the community has already shown a great deal of initiative. The local cinema was saved through community effort. The Last Invasion Tapestry, which is 30.4 meters long and 53 centimeters deep, was commissioned by the Fishguard Arts Society and stitched by 77 local people. Local volunteers run annual jazz and folk festivals, and two entrepreneurs have turned a former church hall into Ffwrn, a bakery, bar, and music venue. Transition Bro Gwaun is itself a shining example of what can be accomplished by a small group of people who are prepared to dream and work hard.